My guest today is Rob Greenfield, and Rob is not a conventional kind of guy. 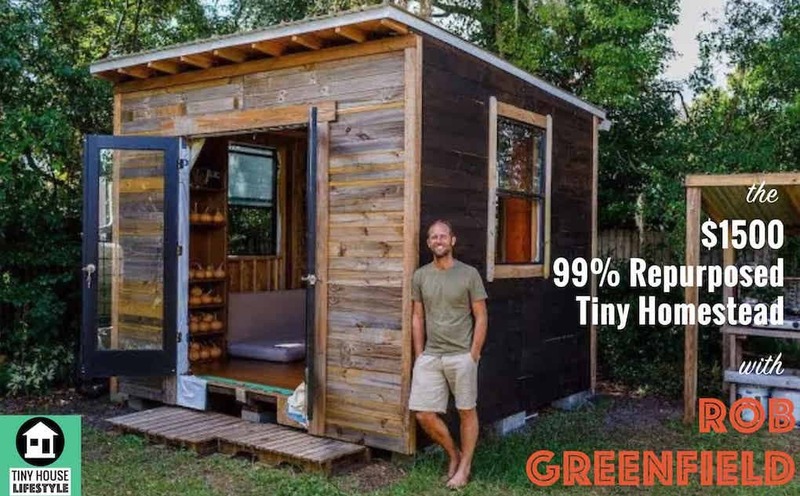 He’s currently living in a tiny house that he built with 99% repurposed materials. He doesn’t have running water in the house, and his current project is called food freedom. He’s growing and foraging for 100% of his food for an entire year. Before you skip this one: It might be easy to say “this is too extreme for me.. I’m never going to do anything like this”, but Rob is truly an example of somebody who is living intentionally and designing experiments for his life to show us all how we can live a little bit better. Even if you don’t plan on living off grid, or foraging for your own food, this is a really unique and interesting interview and I think Rob’s mindset and his enthusiasm and positivity is much needed and will inspire you on whatever tiny house journey you are planning to embark on. Rob Greenfield is an adventurer, environmental activist, humanitarian, and dude making a difference. He is dedicated to leading the way to a more sustainable and just world. Rob is currently living in a 100 square foot tiny house made of 99% repurposed materials in urban Orlando, Florida.